Pacific halibut are one of Alaska’s most valuable fish, but we know surprisingly little about what happens to the species during an important time in their life – their spawning period. 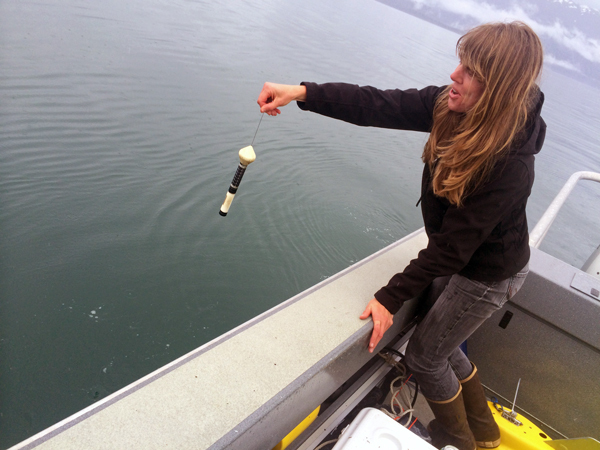 Amanda Compton caught up with a study in Glacier Bay focused on just how halibut spawn using a special type of tracking equipment. What would you do if you lived hundreds of feet below the ocean surface? Where would you eat? When would you sleep? Where would you procreate? 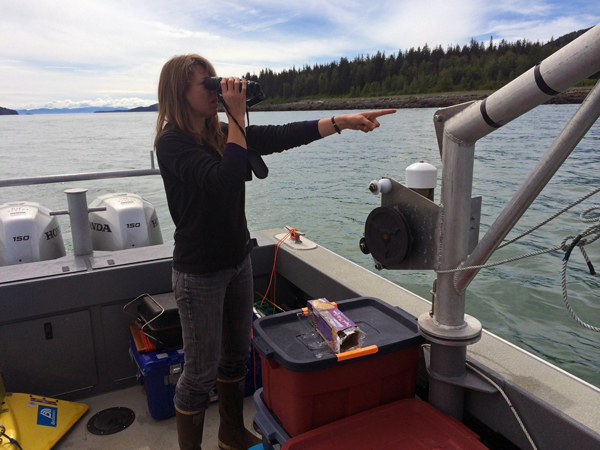 Julie Nielson is a PhD student at the University of Alaska Fairbanks. Fisheries are managed under certain assumptions that determine whether a fisherman can support a family, if a consumer can buy a fish at the local grocery and how much tourist traffic enters the state. Halibut are managed as if they spawn every year and move freely, without preference to localized areas. But are these assumptions true? 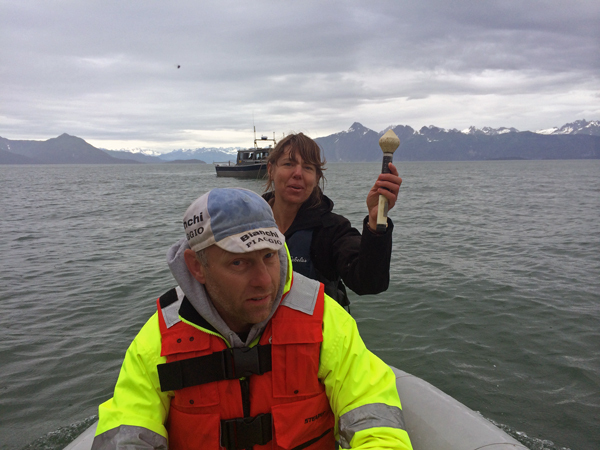 To try and answer this question Nielson attached 25 fish in Glacier Bay with satellite tags in the summer of 2013. Nielson said the tags hold clues to figure out where fish go on spawning migrations, and finding them is a lot like detective work. Tags scheduled to release in February popped off as expected and began transmitting their locations to satellites. All of these tags transmitted locations within the Bay. “I did not expect that at all; I thought we were going to find some that were out in the Gulf,” she said. To find out more than just where the tags surfaced, Nielson had a critical priority – she needed to physically recover the tags. So she asked for help. There was a $500 reward for finding a tag and she made maps of their locations to within 100 meters. People kayaked, ran, took skiffs and one guy even flew over to a spot where a tag was located. But a whole other set of tags were set to release in the summer of 2014. Nielsen’s PhD advisor had been out with her just days before the summer tag release date. For the summer tag recovery trip Nielsen had rented a special tag locating device as Professor Seitz explains. On June 30th Nielson and two colleagues headed north into the Bay to be poised to retrieve the tags. Shortly after 4 p.m. the goniometer began picking up a satellite tag signal. A tag had surfaced, and successfully communicated to a satellite, allowing the Parks Service to access the location of the tag’s transmission. The bobbing white Styrofoam head of the tag was spotted on the east side of the Bay. The rest of the trip brought more success: over half of the tags scheduled to release were retrieved. These days Nielsen can be found in her office, fittingly located above a coffee shop: the rest of her work involves long hours at her computer. Nielson’s findings suggest a majority of the fish prefer the comforts of Glacier Bay, either remaining inside of it or leaving and returning, one to within 1 kilometer of where it was tagged. She’s currently working on a movement model that she hopes will indicate where the fish that left the Bay actually went. The model would ideally assist researchers in mapping the movement of other species besides halibut, like sable fish and Pacific cod.